How in the world could I possibly dread meeting with these cute kids four days a week? I wonder the same thing looking at this picture. Frankly, it doesn’t make sense. At the far left stands Min Cheol. The kid literally has a hop in his step. I am not sure that I have seen him just walk. He either runs or hops. At Halloween, I put together a party and Min Cheol was the only one to dress up. He hopped to class wearing devil horns. Lindsay thought this was the greatest thing she had ever seen. The other day he said “Altizer” perfectly. Next to her is Min-Ju. Definitely the ring leader of fourth grade drama. She also hops when she talks to you in English. She kind of looks like a cheerleader doing a cheer, but usually she is just telling you about who likes who and who hates who. She is so smart and sometimes very funny. Behind her is Jueng Hyun. Jueng Hyun sat beside me the other day at the festival and said “Teacher let’s talk English.” He loves Lindsay. He is really fluent when he wants to be, but most of the time he would rather watch Min Cheol draw. Then there is Su Yeon. 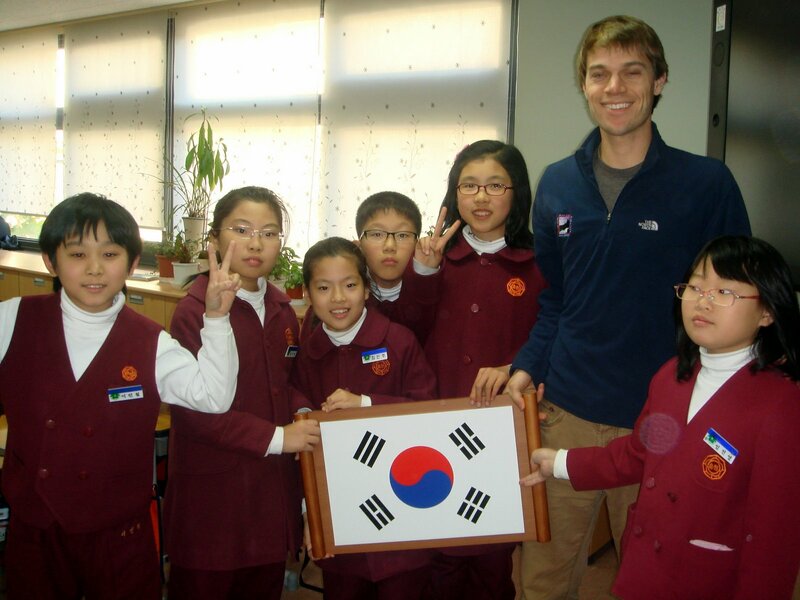 Su Yeon’s Dad teaches at Songwon and they walked us and drove us to school the first two days. She has changed her name from Stella to Tiffany recently and is absolutely pumped about her new penpal Jessica. I forecast another name change soon. Her English is decent, but every once in a while she will surprise me with a big word she knows. Alright, I fell back in love with them today. You should see how hard they have worked on their letters to their penpals. I only hope the American kids will make me as proud.